You know what makes the Punisher comics so great? Truckloads of blood. But after that, inner monologues. I love them — the idea that we as readers get access to the inner thoughts of our favorite characters. We’re all psychics in the Marvel and DC universes! 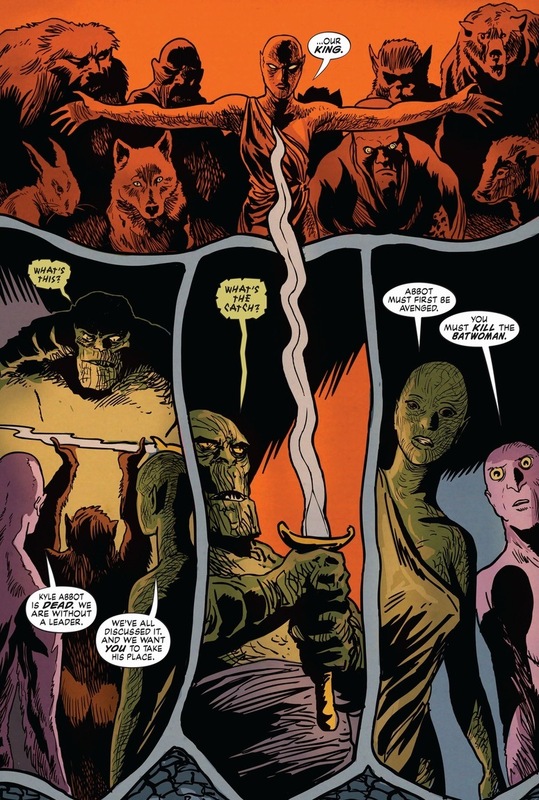 Today, I found a delightful issue narrated by Killer Croc, a Batman villain who’s usually described as somewhere in between sewer-dwelling moron and ridiculous manimal. 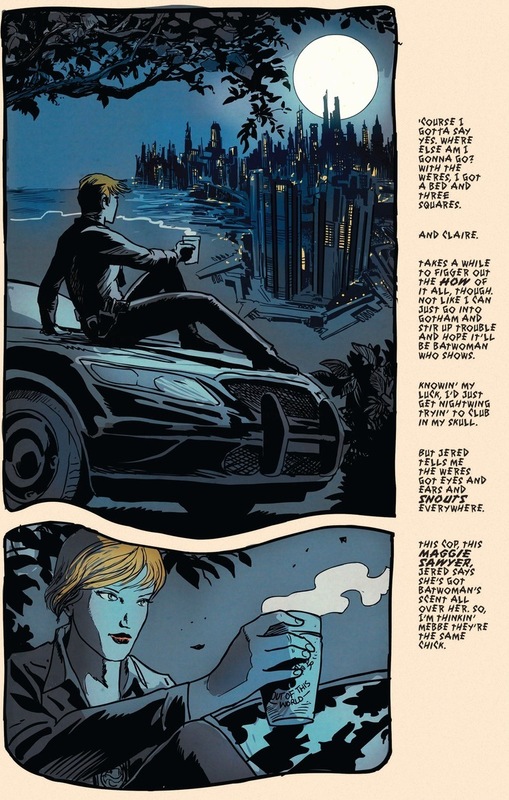 But let your heart open (slightly) because in Batwoman #21, written by J.H. 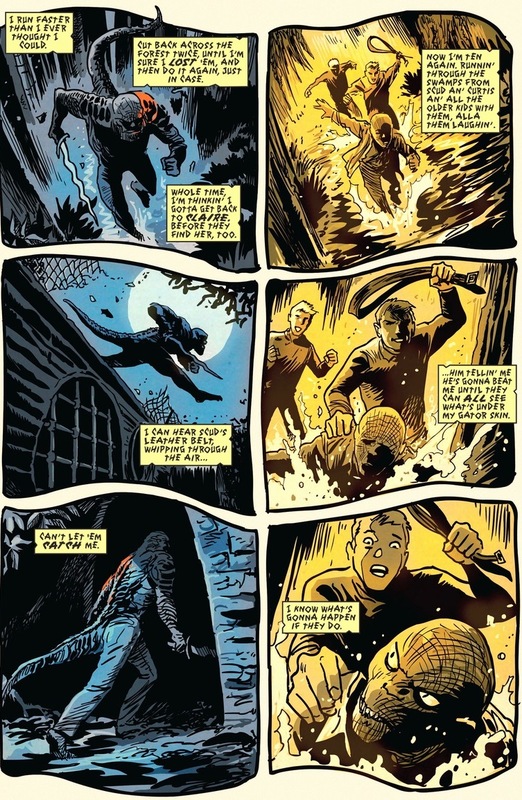 Williams III & W. Haden Blackman and drawn by Francesco Francavilla, we get another side of the story — and while not sympathetic or redeeming in the least — it’ll be a chance for Batman’s B-list rogue to talk about a day in his sewer-dwelling manimal life. Aw, DC’s only two crocodile people found each other! And they aren’t eating each other either — unless manners demand they make out a little before disemboweling. Still, like Killer Croc knows all too well, any happiness comes with a price, and usually in blood because it’s not as if Killer Croc can stop by an ATM or anything. But instead of Killer Croc: frightened sewer embarrassment, how about Killer Croc: brave sewer king? 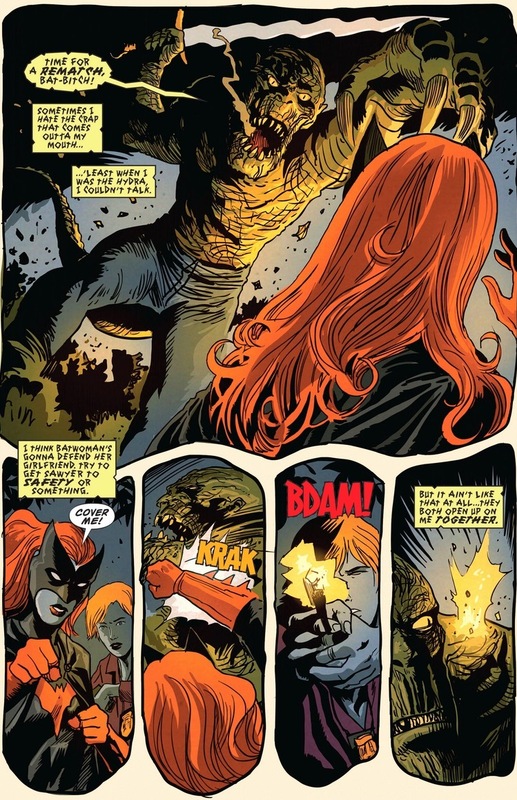 Batwoman (real name Kate Kane), fights crime much like the normal Bat-family way: kung fu and grit. Unfortunately, all the roundhouse kicks in the world won’t penetrate Killer Croc’s superhuman durability or block his super strength. Though as we learned in the last two panels, his heart remains ever soft and mushy. It’s the supervillain curse that so many of them have to prove their love by slaughtering vigilantes. See that smile on Killer Croc’s face? He may have a hideous physical condition, but he’s still a dude deep down. And even though that may have been one of the least romantic kisses in recent comics, Batman’s supervillains make up for their deviousness with their pervertedness. 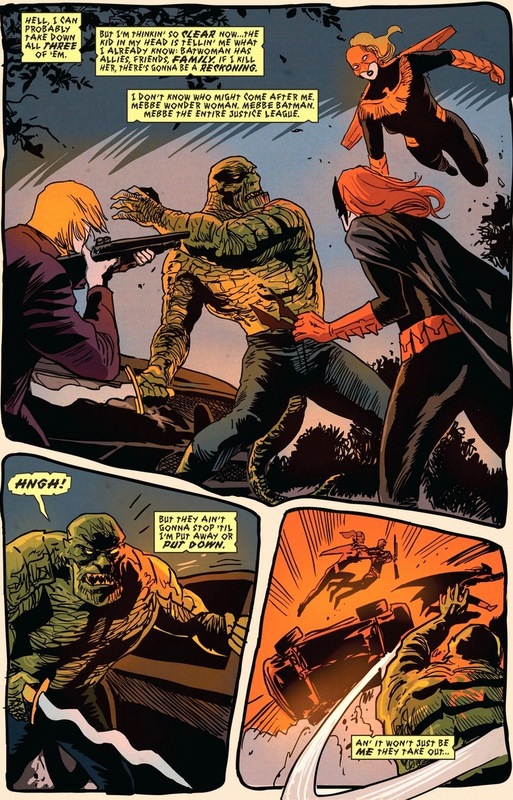 Now because comics demands that every tender moment be shattered by impromptu violence, Killer Croc attacks. Okay, we have to talk about this amazing scene. 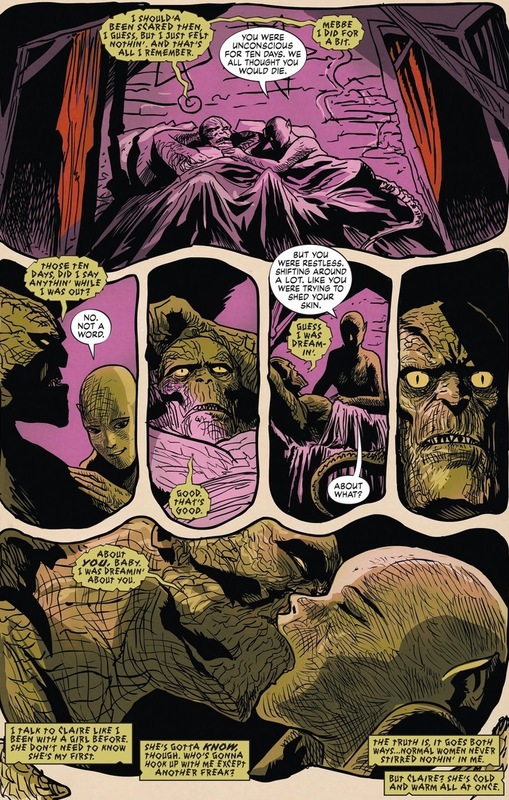 Of course Killer Croc lives with massive self-loathing being a sewer reptile man and whatnot. Relentless teasing, bullying, and other therapy-inducing acts brought upon in his youth don’t go away — especially after decades of cannibalism and Arkham Asylum stays. Even though he looks like a reptile and possesses reptile traits, he’s still a human with human feelings. He lived as Waylon Jones for longer than he’s lived as Killer Croc. Isn’t it great Maggie Sawyer acts as a partner as opposed to a damsel in distress? Batwoman can fight to her full extent knowing that she doesn’t have to protect her fiancée. It’s just a nice change of pace from when Superman always has to rescue his lover Jimmy Olsen Lois Lane. In the New 52 at least, Wonder Woman can survive nuclear explosions, so Superman’s new girlfriend happens to be a bit tougher than his previous love interests. This is off topic, but can we drop the Superman vs. Batman nonsense? The Dark Knight’ll die from a lucky bullet through the chin while Superman would brush off Hiroshima like an inconvenient tan. Batman’s awesome, but he’s also wildly mortal, and that’s the way we like him. 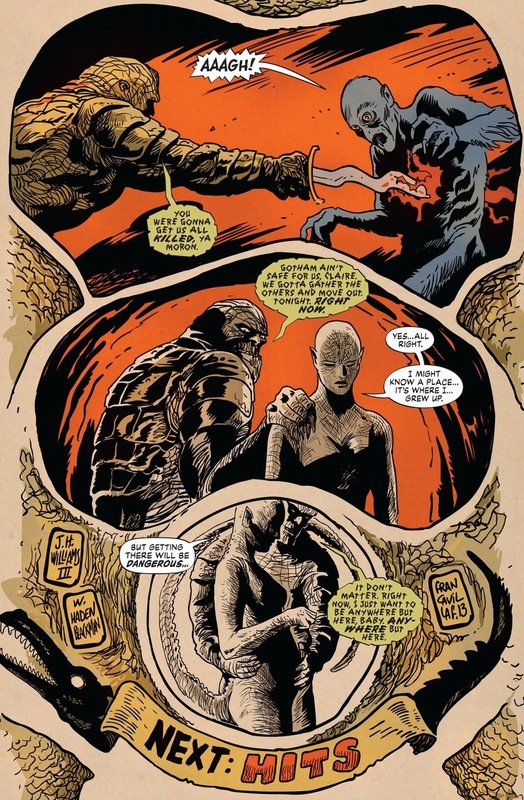 Back to our story, I love that we get the truth behind Killer Croc’s physical pain as well. Batman’s rogue gallery does feature some baddies with superhuman characteristics (like Bane, Poison Ivy, Clayface, Man-Bat, and Harley Quinn to a lesser degree), but they aren’t on the same league as Superman’s or Wonder Woman’s group of evildoers. Batman has to be able to take on his villains with some ingenuity and exploding batarangs, something Doomsday or Ares would laugh off before punching Batman into space. 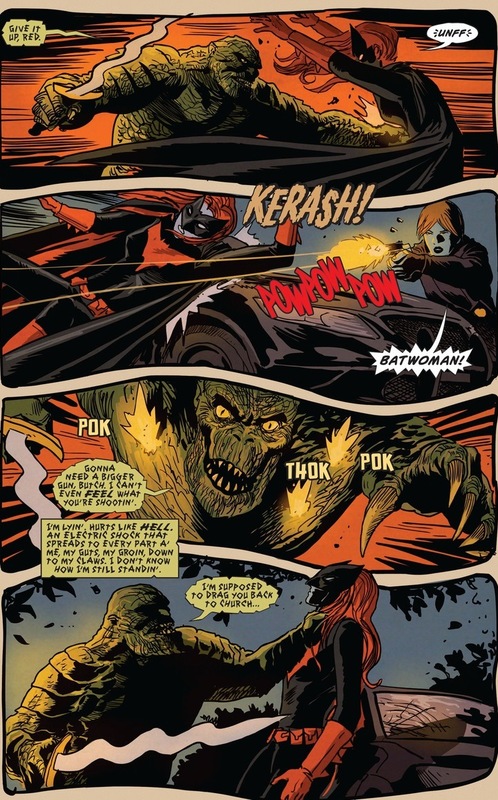 So yes, Killer Croc can take a full pistol clip without slowing him down, but it’s still going to hurt like hell. I like that he admits it, and we’ll remember this fact the next time Batman throws a batarang in his eye. Finally, a third Batwoman buddy shows up. 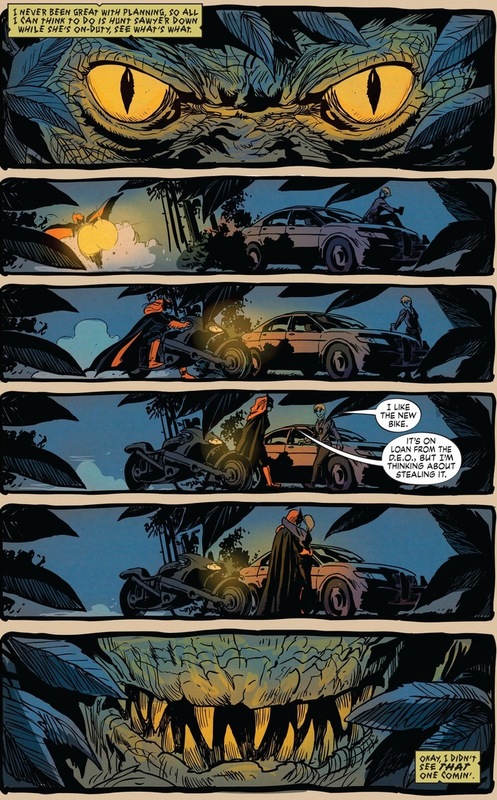 Writers Williams III and Blackman left Batwoman after issue #24. 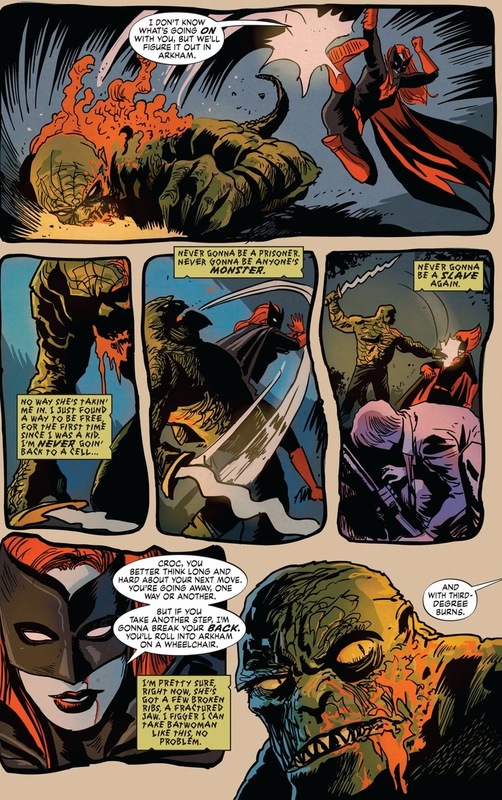 Editorial differences wouldn’t let them marry Batwoman and Sawyer, but relevant to this story, DC forced them to scrap plans to expand upon Killer Croc’s origin and role. It’s quite unfortunate, because as you read the ending today, this marks a phenomenal new start for one of Batman’s most forgotten bad guys. For now, just imagine what would have happened. Our imaginations must be pretty good by now, right? In our next issue on June 23rd, Flash falls out of an airplane! No new AG for 10 days!? NOOOOOOOOOOOOOOOOOOOOOOOOOOOOOOOOOOOOOOOOOOOOOOOOOOOOOOOOOOOOOOOOOOOOOOOOOOOOOOOOOOOOOOOOOOOOOOOOOOOOOOOOOOOOOOOOOOOOOOOOOOOOOOOOOOOOOOOOOOOOOOOOOOOOOOOOOOOOOOOOO!!!!!!!!!!!!!!!!!!!!!!!!!!!!!!!!!!!!!!!!!!!!!!!!!!!!!!!!!!!!!!!!!!!!!!!!!!!!!!!!!!!!!!!!!!!!!!!!!!!!!!!!!!!!!!!!!!!!!!!!!!!!!!!!!!!!!!!!!!!!!!!!!!!!!!!!!!!!!!!!!!!!!!!!!!!!!!!!!!!!!!!!!!!!!!!!!!!!!!!!!!!!!!!!!!!!!!!!!!!!!!!!!!!!!!!!!!!!!!!!!!!!!!!!!!!!!!!!!!!!!!!!!!!!!!!!!!!!!!!!!!!!!!!!!!!!!!!!!!!!!!!!!!!!!!!!!!!!!!!!!!!!!!!!!!!!!!!!!!!!!!!!!!!!!!!!!!!!! I visit your page every Monday, Wednesdays and Fridays. Not just for the images but for the awesome commentary. Thank you! Can i suggest some series ideas? Anyway. Cant wait to see what the next post will be. Thank you so much! That really means a lot to be! I’ll start looking for great bad guy vs. bad guy fights – at least then we know that evil’ll lose, and those are the fights I like the most. Next week is a Flash article followed by a week of Tim Drake stuff, but I’ll get on it! This was one of those stories that started out great then went South fast. I thought it was bad writing, but now, thanks to you, I know it was writers being hobbled by more DC Editorial Mandate. It’s a shame, Bat Woman was one of the few DC books I liked. But but after the Wonder Woman team-up against the Greek monsters it began to flail. Least now we know more about why.